Atlanta features excellent roads and trails for cycling. After a long day in the saddle, you have plenty of cultural options to explore, from museums and performances to improv comedy shows. Here’s a quick guide to help discover the best places to go in and out of the saddle. Imagine smooth cycling under towering pines, over bridges and between rock cliffs, all free from traffic. That’s the beauty of the Silver Comet Trail , a 61.5-mile paved path that stretches from Smyrna to the Georgia/Alabama line in Cedartown. A majority of this recreational trail has only a 2-percent grade, but after mile 45 the path becomes rural. A series of rolling hills comprises the last miles of the trail. 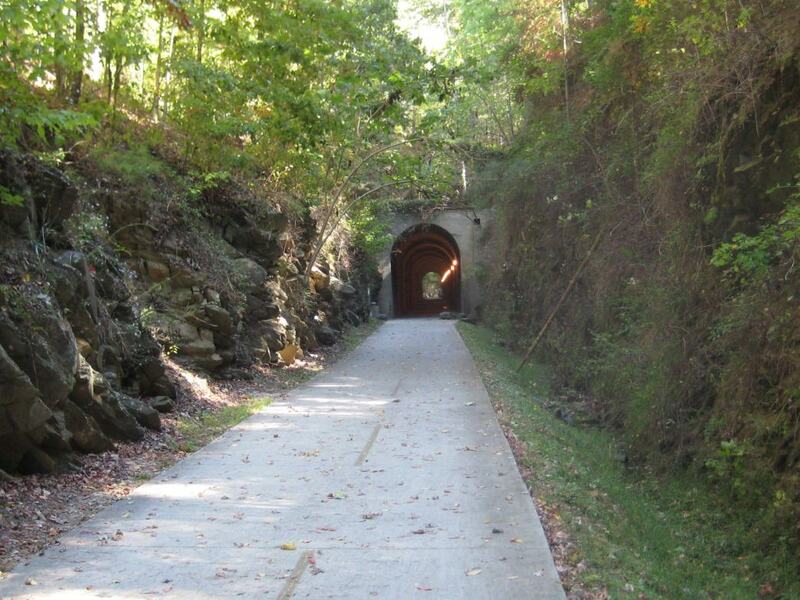 Only 20 minutes from Atlanta, the Silver Comet Trail is a welcomed treat for cyclists who just want to zone out and go. Leaving the city opens opportunities to pedal the rural country roads in Georgia’s smaller surrounding towns. Silk Sheets, south of the city in Serenbe, is aptly named for its smooth roads and rolling hills. Many cycling groups gather for rides and the Atlanta-based Peachtree Bikes has an outpost that leads rides on the 21-mile Rico Starr Loop and 42-mile Cedar Grove Loop. Both loops cruise by sprawling farmlands, cow pastures, and aged barns. Gravel grinding can be found on a few of the connecting dirt side roads, making for a change in terrain that’s suitable for cyclocross riders and daring roadies. Northwest of Atlanta, another ride on country roads is nicknamed the Bud Plant ride, because many cyclists start their ride from the Budweiser plant in Cartersville. These roads are home to the annual Beautiful Backroads Century in September, and just like the routes offered for the race, options range from 15, 25, 33, 65, or 100-plus miles. Similar to Silk Sheets, these long stretches of scenic country roads roll in hilly ribbons that parallel broad pastures and forests. Mountain biking is best in North Georgia’s Blue Ridge Mountains, which is considered to be the mountain bike capital of the state. 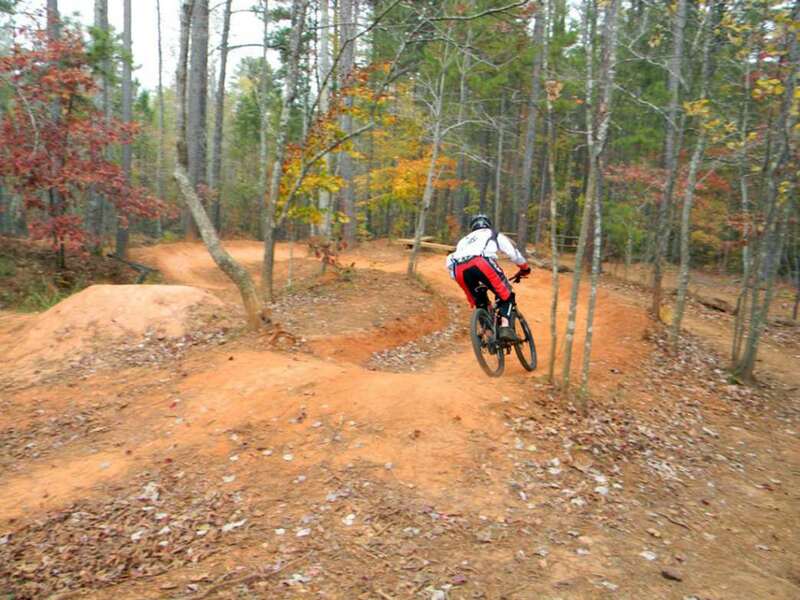 The town of Ellijay is the closest access to the popular 140-mile IMBA EPIC Pinhoti Trail, which is also the longest mountain bike trail in the state. Pinhoti Trail sections 1 through 5 all offer steep elevation, rocks, and switchbacks that are perfect for advanced cyclists. The trails are long and require a lot of stamina and skill to complete. A challenging 19-mile loop connects the Bear Creek Trail with the Pinhoti Trail 1 and 2 sections, and the Mountaintown Creek Trail. The lower singletrack on the Bear Creek Trail and Pinhoti 2 Trail are touted as some of the best descents in the region. 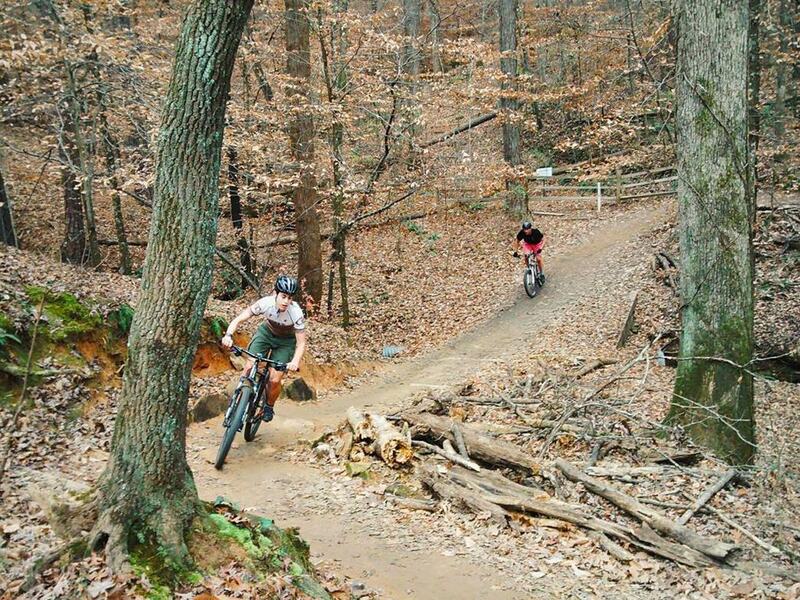 Closer to the city, mountain bikers can squeeze in a quick afternoon ride on a few of the trails maintained by the Southeastern Off Road Bicycle Association. Sope Creek Trail winds along the Chattahoochee River and it is the closest singletrack to the city, just 20 minutes from downtown. These trails are geared toward beginner and intermediate mountain bikers, with short but steep hills. There is a mix of flowing descents and sharp rollers that take riders under dense tree canopy. In Canton, Blankets Creek Trail is great for the seasoned mountain biker. Tight turns, elevated bridges, rough tread (rocks and roots), short and steep elevation changes, tree gates, and log crossings are among the obstacles mountain bikers face on these trails. Seven trails total 16 miles, and among the most difficult are South Loop and the Van Michael Trail. The most popular and highly trafficked is Dwelling Loop, which boasts views of Lake Allatoona and its surrounding creeks. The High Museum in Midtown is one of the leading art museums in the Southeast, hosting more than 15,000 works of art in its permanent collection, in addition to long-running exhibitions. Collections highlight 19th and 20th century American pieces, European paintings, African-American art and a range of contemporary and folk art, and photography. In an effort to draw in the younger crowds, The High Museum has implemented nightlife, with half-priced Friday admission after 4 p.m. On the third Friday of the month, local and national musicians perform live jazz in the museum. On the second Sunday of each month, admission is free from 1 p.m. to 4 p.m.
Atlanta is home to several venues for national shows, musicals, and performers, but one of the most recognized is the Fox Theatre . Its history began in 1928 as home of Atlanta’s Shriners organization, before it transitioned to a movie palace in 1929, but the Fox really became a performance venue after it was threatened to close down forever in the 1970s. After the “Save The Fox” campaign saved the theatre, it has been an institution in the city. The Fox hosts more than 250 performances per year. 2016 headliners include Let It Be: A Celebration of the Music of the Beatles, musician Shawn Mendes, and the “Who Wants to be President” tour with Bill O’Reilly and Dennis Miller. Perhaps one of the best theater spots in the city is Dad’s Garage , which just moved to a new outpost in Old Fourth Ward. Scripted shows are originally written by the staff, and poke fun at current issues in society, guaranteeing laughs from mildly inappropriate jokes. Scripted shows run every few months, and are performed Thursday, Friday, and Saturday. On the improv side, Dad’s Garage also features both traditional and original improv formats, with the most popular and longest-running being TheatreSports that uses audience participation in a improv competition between two teams of Atlanta’s best improvisers. 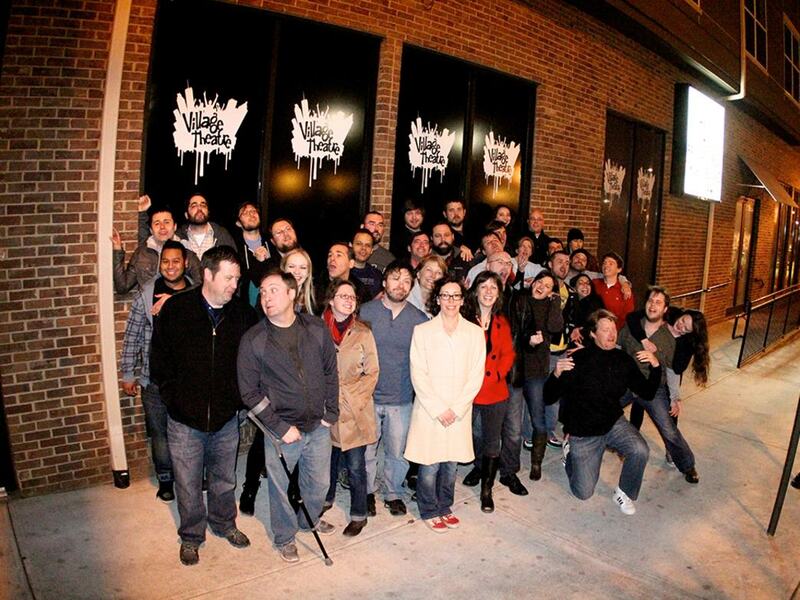 Another great option for improv is The Village Theatre, a strictly improv and stand-up comedy joint in Old Fourth Ward. Improv shows are based around a theme, like “The Improvised Mocu-mentary” and the monthly “Underwear Comedy Party,” where stand-up comedians perform in their skivvies. It’s a great budget-friendly option because tickets are always $5 to $10. Originally written for Atlanta CVB.